Imran Khan identified Pakistan's economic challenges and outlined the deficiencies in the health-care sector. Pakistan's Prime Minister Imran Khan today lashed out at the previous PML-N government for current debt crisis which has risen to Rs 28 trillion, saying the country had not been as indebted in its entire history as it has been in the last ten years. 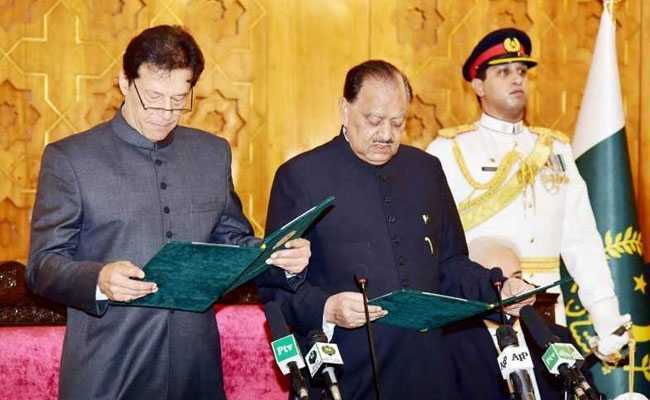 In his maiden address to the nation a day after his swearing in as the country's 22nd prime minister, Mr Khan identified Pakistan's economic challenges and outlined the deficiencies in the health-care sector. "Never in Pakistan's history have we faced such difficult economic circumstances. Our debt burden is Rs 28 trillion. We haven't been as indebted in our entire history as we have been in the last ten years," he said. "The interest that we have to pay on our debt has reached to a level that we have to take more debt to repay our obligations. Our external debt obligations have reached a level that we have to contemplate how we are going to grapple with them," Mr Khan said. He said that on one hand we are so indebted, and on the other hand our human development index ranking is very poor. Pointing out the deficiencies in the health-care sector, he said that at present Pakistan is among the five such countries where infant mortality is highest due to use of contaminated water. "We have the highest rates of mortality for pregnant women. We are unfortunately one of the countries that suffer from the highest incidences of stunting in children. We are talking about 45 per cent of this nation's children," he said. "They are not getting proper nutrition. They are not developing properly. They are automatically left behind. What must their parents go through seeing their children in such a state?" he added. He called up on people of Pakistan to team up with him to eradicate poverty, improve health-care system, provide proper nutrition to children. "We have two paths ahead of us: one is the path we have taken so far - indebtedness, poverty, no funds to help our most vulnerable. The Prime Minister pointed out the difference between the growing lifestyles of the rich and the poor, and hinted that he would adopt an austere style of governance.